Marisa Cordella is an Associate Professor in Spanish linguistics. She holds a PhD in Linguistics from Monash University, an MA and Graduate Diploma in TESOL from the University of Canberra and a BA in translating and interpreting from Chile. Her area of expertise is discourse analysis and she has carried out cross-disciplinary research projects in collaboration with colleagues from Medicine and Psychology both in Australia and abroad. 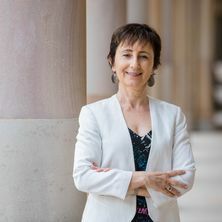 Marisa has led many research groups as well as the Spanish Programs at Monash University and the University of Queensland and she is currently Director of Studies in the School of Languages and Cultures. She has published widely in peer-review journals, book chapters and is author of two books on discourse analysis and medical communication (one sole and one co-authored) and recently published a co-edited book on intergenerational and intercultural communication. Her research expertise and postgraduate supervision are in the areas of discourse analysis, intercultural and intergenerational communication, medical communication, ageing across cultures and translation studies. Huang, Hui and Cordella, Marisa (2017) Utilising local community resources for Chinese cultural learning: An intercultural interaction model. Babel, 51 3: 24-34. Huang, Hui, Cordella, Marisa, Browning, Colette and Baumgartner, Ramona (2016). An innovative model for second language learning and social inclusion. In Marisa Cordella and Hui Huang (Ed. ), Rethinking second language learning: using intergenerational community resources (pp. 226-237) Bristol, United Kingdom: Multilingual Matters. Huang, Hui and Cordella, Marisa (2016). Community resources on our doorstep: language learning in action. In Marisa Cordella and Hui Huang (Ed. ), Rethinking second language learning: using intergenerational community resources (pp. 37-48) Bristol, United Kingdom: Multilingual Matters. (2014–2015) Association of Independent Schools of Queensland Inc.
(2013) Association of Independent Schools of Queensland Inc. Rethinking second language learning : using intergenerational community resources. Edited by Marisa Cordella and Hui Huang Bristol, United Kingdom: Multilingual Matters, 2016. Cordella, Marisa The dynamic consultation : a discourse analytical study of doctor-patient communication. Amsterdam , Netherlands: John Benjamins Publishing, 2004. Cordella, Marisa and Kokubu, Cecilia (2016). Creating, maintaining and challenging rapport across languages and age groups. In Marisa Cordella and Hui Huang (Ed. ), Rethinking second language learning: using intergenerational community resources (pp. 110-148) Bristol, United Kingdom: Multilingual Matters/Channel View Publications. Cordella, Marisa and Huang, Hui (2016). Introduction. In Marisa Cordella and Hui Huang (Ed. ), Rethinking second language learning: using intergenerational community resources (pp. xix-xxv) Bristol, United Kingdom: Multilingual Matters. Cordella, Marisa and Huang, Hui (2016). Introduction: Rethinking second language learning : using intergenerational community resources. In Marisa Cordella and Hui Huang (Ed. ), Rethinking second language learning : using intergenerational community resources (pp. XIX-XXV) Bristol, United Kingdom: Multilingual Matters. Cordella, Marisa (2016). Taking a stance: older native speakers with young language learners. In Marisa Cordella and Hui Huang (Ed. ), Rethinking second language learning: using intergenerational community resources (pp. 51-65) Bristol, United Kingdom: Multilingual Matters. Cordella, Marisa (2016). The immigrant potential: multiculturalism, language skills and community resources. In Marisa Cordella and Hui Huang (Ed. ), Rethinking Second Language Learning: Using Intergenerational Community Resources (pp. 3-24) Bristol, United Kingdom: Channel View Publications. Lambert, Brigitte and Cordella, Marisa (2016). The migration experience and the ethos of self. In Marisa Cordella and Hui Huang (Ed. ), Rethinking second language learning: using intergenerational community resources (pp. 66-84) Bristol, United Kingdom: Multilingual Matters. Huang, Hui and Cordella, Marisa (2015). Community resources and a new model of teaching and learning of Chinese language. In Q. Chen, Y. Wu and J. Ye (Ed. ), Chinese research and international communications (pp. 527-539) Shanghai, China: East China Normal University Press. Cordella, Marisa and Huang, Hui (2015). L1 and L2 Chinese, German and Spanish speakers in action: Stancetaking in intergenerational and intercultural encounters. In John Hajek and Yvette Slaughter (Ed. ), Challenging the monolingual mindset (pp. 97-112) Bristol, England, United Kingdom: Multilingual Matters. Cordella, Marisa (2015). Poetry in translation. In Ulrike Fischer (Ed. ), Three suns I saw: a life in letters (pp. 491-492) Brisbane, Australia: Boolarong Press. Willoughby, Louisa, Musgrave, Simon, Cordella, Marisa and Bradshaw, Julie (2014). Being heard: the role of family members in bilingual medical consultations. In Elke Stracke (Ed. ), Intersections: applied linguistics as a meeting place (pp. 22-42) Newcastle upon Tyne, United Kingdom: Cambridge Scholars Publishing. Cordella, Marisa (2007). 'No, no I haven't been taking it doctor': noncompliance, face-saving and face-threatening acts in medical consultations. In Maria Elena Placencia and Carmen Garcia-Fernandez (Ed. ), Research on politeness in the Spanish-speaking world (pp. 191-212) Mahwah NJ: Lawrence Erlbaum. Cordella, Marisa and Thornton, Loren (2014) Language learning at the doorstep of schools: community resources. Catalyst, Spring 28-31. Normand-Marconnet, Nadine and Cordella, Marisa (2012) Spanish and French foreign learners' blogging experience: motivation and attitude. JALT CALL Journal, 8 1: 3-16. Cordella, Marisa (2011) Enfrentándose al cáncer en compañía: el rol del familiar en la consulta oncológica. Discurso and Sociedad, 5 3: 470-490. Cordella, Marisa (2008) Two experts and one patient: Managing medical practices and religious beliefs. Monash University Linguistics Papers, 6 1: 19-28. Cordella, Marisa and Spike, Neil (2008) Working toward a better communication between international medical graduates and their patients in Victoria. Health Issues, 96 Spring: 28-29. Cordella, Marisa (2007) Unveiling stories to the oncologist: a matter of sharing and healing. Panacea, 8 26: 230-238. Cordella, Marisa (2007) Subtitling the film 'The children of Russia': enhancing understanding through a series of linguistic transformations. IC: Revista Cientifica de Informacion y Comunicacion, 1 4: 78-87. Cordella, Marisa (2006) Discourse analysis and the subtitles of documentaries: the case of The Children of Russia. Odisea, 7 77-88. Cordella, Marisa (2004) You know doctor, I need to tell you something: a discourse analytical study of patients' voices in the medical consultation. Australian Review of Applied Linguistics, 27 2: 92-109. Cordella, Marisa (2003) En el corazon del debate: el analisis del discurso en la representacion de las voces medicas. Oralia, 6 1: 147-168. Cordella, Marisa (2002) La interaccion medico-paciente en escrutinio: un estudio de sociolinguistica interaccional. Onomazein, 1 7: 117-144. Mascitti-Meuter, Monita and Cordella, Marisa (1999) CALICO Software Review. Español En Marcha: self-study Spanish course. CALICO Journal, 16 4: 624-634. Cordella, Marisa (1999) Medical discourse in a Hispanic environment: power and simpatia under examination. Australian Review of Applied Linguistics, 22 2: 35-50. Cordella, Marisa and Forbes, Katie (1998) Discourse control and leadership in Spanish conflict talk. Onomazein, 1 3: 45-61. Cordella, Marisa (1992) Travels, cultures and speech acts: a pragmatics study in apology. Ken Garrad Working Papers in Hispanic Studies, 1 2: 1-23. Cordella, Marisa (1991) Spanish speakers apologizing in English: a cross-cultural pragmatic study. Australian Review of Applied Linguistics, 14 2: 115-138. Cordella, Marisa (1990) Apologizing in Chilean Spanish and Australian English: a cross-cultural perspective. Australian Review of Applied Linguistics, S 7: 66-92. Cordella, Marisa and Normand-Marconnet, Nadine (2012). Enhancing motivation for writing in a foreign language: Blogging in Spanish and French. In: John Hajek, Colin Nettelbeck and Anya Woods, The Next Step: Introducing the Languages and Cultures Network for Australian Universities. Selected Proceedings of the Inaugural LCNAU Colloquium. LCNAU: Language and Cultures Network for Australian Universities Inaugural Colloquium 2011, Melbourne, VIC, Australia, (237-250). 26-28 September, 2011. Mistica, Meladel, Baldwin, Timothy, Cordella, Marisa and Musgrave, Simon (2008). Applying discourse analysis and data mining methods to spoken OSCE assessments. In: Proceedings of 22nd International Conference on Computational Linguistics. 22nd International Conference on Computational Linguistics, Stroudsberg, PA, United States, (577-584). 18-22 August 2008. What are the prevailing attitudes, perceptions and context that underpin the low retention rate for Queensland students of foreign languages, and comparing this issue nationally and internationally, how can it be resolved through education policy, curriculum, and schools?